A rich devils food cake filled with white chocolate & topped with chocolate whipped cream. A quick & easy dessert that 's perfect for any chocolate lover. Bake cake as directed on package for a 9x13-inch pan. Let cool for 5 minutes then poke holes over entire cake, spacing about 1" apart, using the back of a wooden spoon. Place condensed milk and white chocolate chips in a microwave-safe bowl. Melt in 30 second increments, stirring in-between, until chocolate has melted. Whisk in milk. Pour immediately onto cake, making sure holes are filled. Let cake cool. Once cool, place in refrigerator for about 1 hour. Remove from refrigerator and make frosting. To make frosting, melt dark chocolate in microwave-safe bowl in 30 second increments, stirring in-between, until chocolate has melted. Stir into Cool Whip. 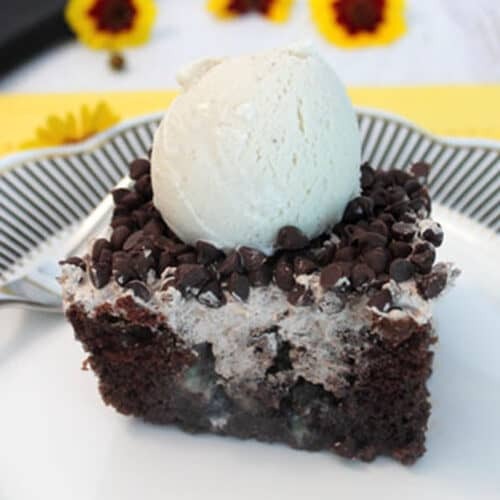 Frost cake then cover with mini chocolate chips or sprinkle with chocolate shavings or colored sprinkles.